Guest Post by Charlie Davenport: A Great Day with My Sons! - the4pointer.com | Real Hunts. Unreal Stories. Guest Post by Charlie Davenport: A Great Day with My Sons! 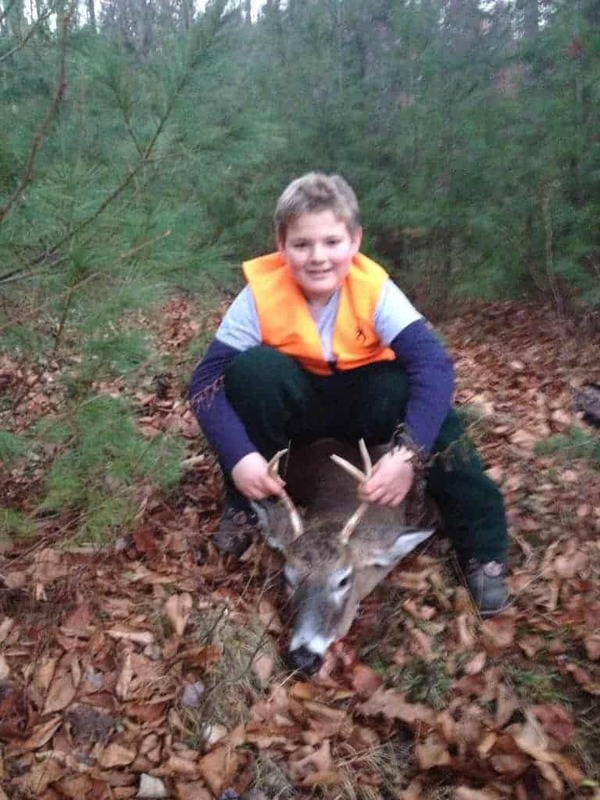 Charlie’s son Hunter proudly displays Charlie’s 4 pt buck. The day started out like all the rest, we went out and sat for a while. Derrick, my oldest son who is 17, was in some Oaks while Hunter, 12, and I sat on the other side of the ridge. We didn’t see much in the morning and not much of anything all day. I was not discouraged as I stated above, I was on cloud nine having the opportunity to hunt with my boys. For the afternoon sit we picked a large field out behind my dad’s house. Dad normally goes hunting with us but was in Florida for the week. Hunter and I were sitting in a popup blind at the edge of the field while Derrick was overlooking an apple orchard in his first ever tree stand hunt. There were three separate routes that the deer would take to get to the field and I was hoping that it would be the first or third route. We were sitting near route 1 in which they would come out to our left and Hunter would be able to get a nice shot on one. Route 3 came right in front of Derrick where he would be able to make the shot, while route 2 would be a long shot, 175-200 yards, as you would have to shoot before the deer got between us and Derrick. Not long after we got situated we heard some noise coming our way. Out popped 2 doe from route one and we got to watch them for the duration of the event. They were out alone in the field for probably 20 minutes before Derrick texted and said he had a doe going by him, route 3, headed for us. Now things were starting to happen! About 15 minutes later Derrick said he heard something else coming but couldn’t see it. That’s because it was coming out route 2……… I had started to unzip the door to the ground blind in anticipation of me having to exit it to get a shot. 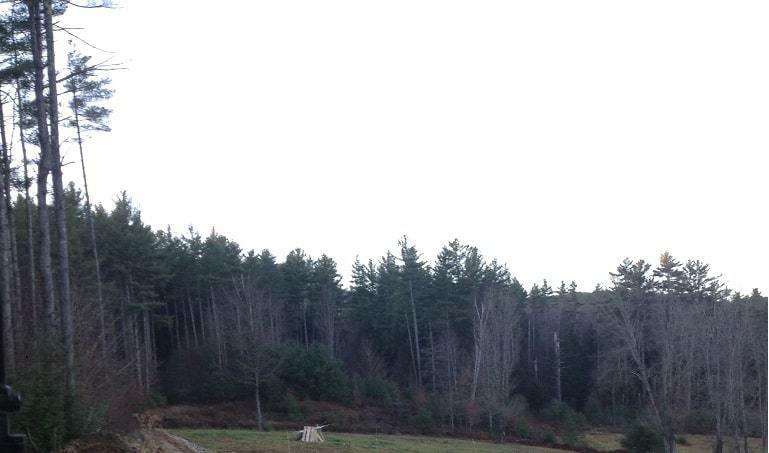 And there he was, nice little 4 point buck prancing across the field. I slipped out of the ground blind and found a rest and pulled up on him. There was a small ravine between me and him so I didn’t have long to pull the trigger. Focus…squeeze….Bang! I thought that I hit him perfectly, but he ran. He flew through the ravine headed for the patch between Derrick and us. I told Hunter to get ready as we were going to get another crack at him, I was still puzzled as to why he was still standing. He stopped in the middle of a small cluster of apple trees and he looked as if he was going to drop right there. I started to pull up, as did Hunter, but noticed that it was in the direction of Derrick. I had Hunter lower his rifle as I kept an eye on him. All of a sudden he moved far enough out of the direction of Derrick and I touched one off. Positive I hit him that time, but he still ran and then he was out of site. He ended up running 50 yards, to the other side of the ravine, and that was it. There he was, not a huge buck, 125 pounds, but legal and he tasted great. Come to find out, the first shot I made was perfect, right behind the front shoulder. And it tore stuff up. I am so puzzled as to why he didn’t drop right there. Had I known this, I would have just waited until he dropped. That would have been a much easier drag. But at the end of the day, we have a deer hanging, soon to be in the freezer and I, as a father, got to enjoy some very special moments with my two sons. It just doesn’t get any better than that!